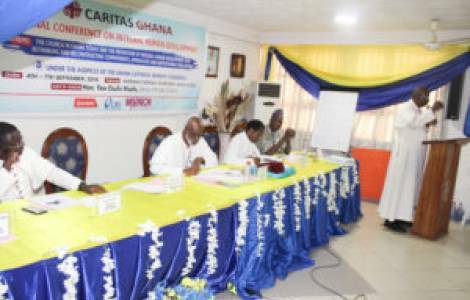 AFRICA/GHANA - The Bishops: "Illegal migration from our country is an evil that must be faced"
Accra (Agenzia Fides) - 4,092 Ghanaians were repatriated from Libya in 2017. This is what the Bishops of Ghana wrote in the statement published at the end of their Annual Plenary Assembly held in Techiman, in the Brong Ahafo region. The document, sent to Agenzia Fides, shows the official statistics of the government of Accra according to which out of the more than 4,000 Ghanaians repatriated, 1,562 come from the Brong Ahafo region, located in the central part of the Country. "Our meetings in Techiman offered us the opportunity to hear the lamentations of traditional and political authorities, the host Bishop and other stakeholders about the spate of irregular migration in Techiman, Nkoranza and the Brong Ahafo region as a whole", write the Bishops who declare themselves "saddened by the unfortunate loss of lives in the desert and the Mediterranean Sea of young men and women embarking on these perilous journeys. We share the anxieties of families who have lost contact with their relatives and pray for their safe return". The Episcopal Conference of Ghana renews its commitment to contribute "to minimizing the high level of migration in this part of our country" by instructing Caritas Ghana "to prioritize activities to address this threat in the Brong Ahafo region and in the entire Country". The Church is also committed to reducing youth unemployment by launching two new programs: Social Impact Investement and Social Enterprises Initiatives. Another issue addressed by the Bishops is that of environment. Ghana is one of the largest recipients of global electronic waste. Several areas of its territory are polluted by heavy metals contained in electronic devices thrown into huge open dumps. The Bishops complain about "the increase in garbage and obscene piles of discarded plastics, electronic waste and other materials that choke our gutters, roads and other public places".